I know that when first started doing research into blogging it seemed to be almost impossible to start now and still get successful. There are already so many amazing blogs out there that started years ago and who grew a very impressive following. 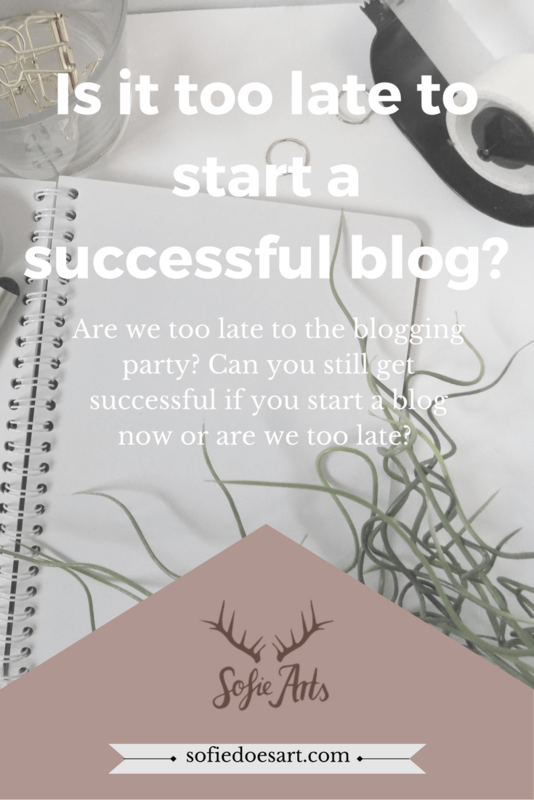 So are we, who are just starting out, too late to be successful bloggers? The number of blogs is always growing but the amount that goes inactive grows as well. Maybe you have an inactive blog of your own still lying around. Even the blogs that do not go inactive are not all professional bloggers and there are many people who just do it as a hobby. So if you are looking to start a successful blog the number of existing blogs would not be a problem. There are still many blog readers. As long as people keep reading blogs, there is an audience and that audience keeps looking for new content. Many people say the trust the opinion of bloggers. While many new blogs are created every day not every single one will turn out successful. But there are still people who make it in this medium and that should give us hope. People who still set up successful blogs and businesses within a year online are a good example of the fact that blogging is not dead yet. Maybe you think blogging is old and there new things replacing it. While there are may new things that come around not all of them stick. Many of the ones that do stick get easily integrated into the already existing blogging world. For example, for a while, everybody has been saying it. The new medium is videos on Youtube (but maybe we are even late for that). Video content seems to be the next thing. And while the video content has loads of great advantages and opportunities it doesn’t always replace the blog. Many people who switched from a blog to Youtube still have their blog and write on there as well. Often you also see people who use youtube as a marketing tool to get people to their site/blog. This is done by offering more written content. You can add, for example, extra’s, give freebies and in-depth information in the blog post of a video. Many people use video to add to their blog instead of leaving their writing for filming entirely. While there are may new things, writing has always been a great way to share stories. And that is what blogging does. It is a way to share stories, information and much more. The Internet is so global, it just gives you a lot more chance to share your stories. If there is one thing that gives me hope for blogging it is that the playing field keeps changing. Instagram, for instance, is quite new (6 years), but already it is an amazing way to market. Snapchat is also a major marketing tool and only 5 years old. There are so many new platforms to explore and use and they keep making new ones. The image editing has gotten a lot more automated. Think of the gorgeous templates available. And more and more tools for blogging keep popping up. Think of social media scheduling and the amazing programs to make even more interactive content for your blog. Some of the old-school bloggers started on sites where they did everything with HTML and where social media was non-existent. Now we see new networks and tools every day. As long as you stay on top of things, blogging can be very modern indeed. I am not saying that you should join every new thing out there, but it doesn’t hurt to stay up to date with them. And if you really love the idea of something why no just try it out? Blogging won’t be gone anytime soon so getting your own blog started can still result in amazing results. You can still create a successful blog. But like all things, it will take time and there is much to learn. But getting started is already a big part of the process. It takes bravery to get our there and promote yourself! Let me know how you think the future of blogging looks! And don’t forget to share this post with any beginning blogger friends!